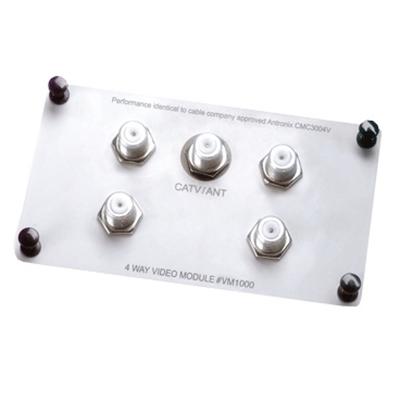 Detailed Description: On-Q 4-Way Passive video splitter/combiner is designed for digital cable, pay-per-view and high-speed cable internet. It comes with bracket for easy installation. It works with signals that have frequency of 5 - 1000 MHz and offers crystal-clear picture quality on TVs in the home. It has flammability rating of UL94-V0 to withstand harsh environmental conditions. Insertion Loss 5-40 MHz: 6.8dB. 40-200 MHz: 7.0dB. 200-550 MHz: 7.2dB. 550-750 MHz: 7.4dB. 750-1000MHz: 7.8dB. Isolation 5-14 MHz: 25dB. 14-40 MHz: 40dB. 40-200 MHz: 35dB. 200-550 MHz: 28dB. 550-750 MHz: 26dB. 750-1000MHz: 24dB. Return Loss Input: 22dB. Output: 5-14 MHz: 22dB. 14-40 MHz: 38dB. 40-200 MHz: 28dB. 200-550 MHz: 25dB. 550-1000 MHz: 22dB. Special Features Performance identical to cable company approved Antronix CMC300 Series. High performance splitter designed for digital cable, On Demand, Pay-per-View and high-speed cable Internet. Bracket included.